If you consider yourself an American history buff, then you may take great pride in your knowledge of America’s rich and storied past, and this may even extend to the way you decorate your home or place of business. 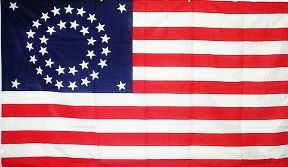 History buffs are usually the best customers of any store that has historical American flags for sale, and FlagPro.com is no exception. 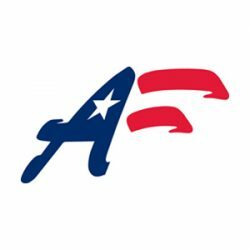 Even though they sell a fair amount of advertising flags, sports banners and custom flags for a variety of industries, the fact that they have a spectacular selection of historical American flags for sale is what makes FlagPro a favorite web site among vexillologists, or flag collectors. What is the best way to move new or used cars off of the lot? According to car and truck dealerships across the country, promotional flags and banners play a more important role than you would think. 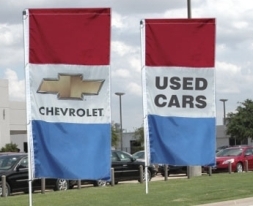 Whether your dealership is located in a rural area or on a busy street with several other auto dealers, you want to catch people’s eye when they drive by, and there is no better way to do this than colorful flags waving in the wind. The philosophy behind this is simple. Promotional flags and banners are never static; they are always moving a little bit in the breeze. Drivers can tune out a lot of the background while they’re driving, including buildings and billboards, but they tend to notice anything that is moving. Even if a promotional banner just causes a driver to glance in the direction of a car lot, chances are there will be something of interest to keep their attention. It is always hard to believe how quickly the seasons fly by, but in just one month we will all be celebrating Memorial Day. Perhaps this is the year you promised yourself you would find a USA flag store and hand a fresh new star-spangled banner at your first backyard barbecue. 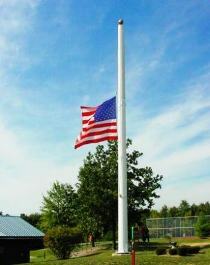 If there is ever a day for flying the American flag, it is on Memorial Day. As the unofficial start of summer, it is this three-day weekend that begins the swim club season, the beach house rental season, and the popular backyard barbecue. But there is an even better reason than this to visit a USA flag store within the next few weeks. Memorial Day is a day when Americans recognize the sacrifices made by thousands of veterans from the U.S. Army, Navy, Air Force and Marines. It is a day when we remember our fallen soldiers from every town across the country, in ceremonies both small and large. On Memorial Day, families take the time to fly the flag properly, in a way that respects the solemn origins of this national holiday.